In European folklore, moths were regarded as witches. Not a big stretch. Witches are creatures of the night. Moths are creatures of the night. Witches can transform themselves…. Moths can transform themselves (metamorphosis)…. Witches fly. Moths fly. Witches have long noses. Moths have long noses. All hail the Black Witch Moth. It might be a harbinger of death–or a sign that your future includes a lucky lottery ticket. The intriguing Black Witch Moth, sometimes known as “the bat moth” resembles a bat in size and shape and with a a seven-inch wingspan is the largest moth in North America. They are common in these parts. Reports of large, bat-like moths surprising people, frequently as they return home and are unlocking their front door, are not uncommon. We spooked several Black Witch Moths on a recent visit to the Santa Ana Wildlife refuge in the Rio Grande Valley, where they roosted under wooden benches and in the eaves of the breezeway near the entrance to the visitor center. When these big boys flush, they get your attention. Females have a white, sometimes iridescent stripe across their wings with wings open. Males exhibit the plain, grey, brown mottled pattern commonly associated with moths, but with small dark eyespots on each forewing. Black Witch Moth caterpillars eat legumes, and favor acacia and mesquite. They are perfectly harmless, not an agricultural pest, and have no teeth or stingers. The folklore surrounding Black Witch Moth, like the moth itself, is all over the map. In Mexico they are known as “mariposa de la muerte,” the butterfly of death. Some believe if a Black Witch Moth enters the home of someone who is ill, the person will die. A variation on the folk wisdom suggests that the moth must travel to each corner of the house for death to occur. The Mayans called the Black Witch x-mahani-nail, which means “the habit of entering buildings.” This moth apparently has a long history of inviting itself inside. Interestingly, in the Carribean, the Black Witch Moth is known as the “Money Moth” and if it visits your home, you are likely to come into cash. Here in South Texas, some believe if a Black Witch Moth roosts over your door, you will win the lottery. Native to Central America and Mexico, the Black Witch starts migrating north in late spring. “The migration has been going on since June,” said Quinn. Because of our timely rains and climate change, several Black Witch Moth “records” have been set, meaning the moths have appeared further north earlier in the year than ever. “This year may end up as the best year yet for Black Witch Moth (BWM) records,” wrote Quinn to the University of Houston Texas Butterfly Listserv, which includes more than 250 novice and professional lepidopterists. Quinn has recorded more than 500 records so far, including a significant record in Maine, in mid June. Serial killer Hannibal Lechter inserted actual Black Witch Moth cocoons into the mouths of his victims in the movie, Silence of the Lambs. reaching Maine by June 9 and Manitoba, Canada, by June 28. That’s a rapid pace for a moth. 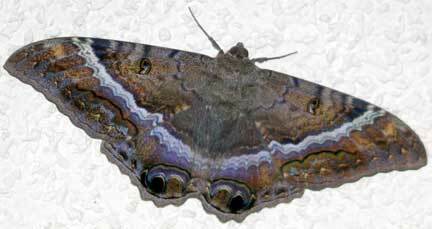 Scientists wonder why the Black Witch Moth migrates so far north with no southbound return? Hmm. In the movie Silence of the Lambs, serial killer Hannibal Lechter inserted cocoons of Black Witch Mothsinto the mouths of his victims as a weird gesture of transformation. The moth on the movie poster is a Death’s Head Hawk Moth, but the actual cocoon was that of a Black Witch. If you’d like to have one roost above your door to inspire a winning lottery ticket, you might try setting out a cocktail of fermented fruit or stale beer. Black Witch Moths also like tree sap. Good luck! I woke up to find one of these beautiful moths resting by the curtains in our living room, in Buenos Aires, Argentina. He had a split down the rear end of his right wing and his right-hand feeler (?) appeared to be missing. Anyway, since we have two cats, who wouldn’t hesitate in grabbing him, given the chance, I caught him in a large jar and released him out the front door. He flew off quite happily into the trees. Must have had a wingspan of at least five inches and was quite beautiful, actually. I took some photos too, prior to releasing him and buying a lottery ticket! I have one of these moths in my house right now. In Michigan it is 32 degrees and 5 inches snow on ground. I don’t want to kill it. I have seen him in the summer and I though he got out, until I see him 2 weeks ago in my house. He perches himself on the wall by my tv in open site. I just can’t throw him outside, or he will die, and I’m not going to kill it, because he’s harmless. Is this going to turn into a caterpillar or butterfly? Any suggestions on what I should do or care for it?? I know it sounds silly, but he’s been in all the rooms, and I think he follows me and then just perches himself in front of me in open space on the wall. I know silly, but I think he knows I don’t want to hurt him, lol!! Just weird to see this in the cold winter months. I live in Henry County, Missouri, and found one of these moths on my living room ceiling earlier today! I’d estimate its wingspan was about 5″ but kinda hard to tell exactly as I have 10′ ceilings in my house….and how it got INSIDE my house I have no idea. I stood on a chair to try to get a picture of it; it wasn’t a really clear photo but good enough that I could identify it. I found another one last summer on the underside of my porch swing and when I disturbed it, it took off in a wild, zigzag pattern like a bat outta hell! I still don’t know how I’m gonna get it out of my house, but I’m very pleased I was able to see another one–SO awesome! I found this impressive moth on my moms window in Miami, FL. It did indeed make us think of s bat in size. I don’t normally play the lotto but plan on buying one this week! Found a Black Witch Moth hiding from the sunlight in Tuscaloosa, Alabama today. Impressive creature! Update to my previous post: I neglected to mention that I live in Mission Viejo, CA. As soon as it became dark, the moth continued with his journey. P.S. I bought $20 of lottery tickets and didn’t win anything. I am happy that I was able to witness this incredible moth. That was my gift! Woke up to a male black witch moth this morning on my patio screen door. It’s huge; it does look like a bat! I read that superstition suggests that I might win the lottery. I will have to buy a ticket today! Just found a beautiful Black Witch mouth in my garage in Central Kentucky! Just saw one outside the front door of my bank in Yukon, OK as I went in to deposit my check. It was resting on a red brick wall and was nearly camouflaged. Its wingspan was easily 5-6″. It’s beautiful and I hope no one hurts it. Wish I could post a picture. 1:30 am here in Austin, TX. Walked outside into my garage and saw a black bat (so I thought) on my white wall. Got a little closer and realized it was a black moth. Not sure what to do since it can’t get out unless I raise the garage door! Be happy it blessed you with it’s presence. They are quite large and special. It wasn’t Hannibal lector that placed the cocoons in the victims mouths, it was the buffalo bill character in the movie that did it. I live just outside of New Orleans and this big moth paid me a visit tonight. I got a good picture of him near my porch light. I do get quite a few big moths that come to my back door area. A white striped phoenix also has visited as well as a few other phoenix types. I like them and are amazed that they are not disturbed by my presence. Is there a website where I can report my sightings and or pictures? I didn’t even know that this witch moth existed.. I woke up to get bottle water .. As I was walking I seem something it was one top wall by the door. I don’t know how long it was there.. I got scared I got some spray from kitchen counter sprayed it it flew I tried looking for it I couldn’t find it.. Says if someone I’ll it means death. Why did I have to encounter this butterfly..
Was it inside the house? Did you have an open window? Leise, I feel your pain!! I am terrified of those things…and any moths for that matter. I saw one of these recently in my apt complex hallway. It was nesting above my neighbor’s doorway. I was so scared that it was going to fly into my apt when I opened my door. I actually had my brother-in-law drive over and remove it. I can’t even imagine seeing more than one at a time. I know they are safe & harmless, but they just look scary. And anything that has the capability to FLY into my face is not good. I don’t even like birds. In fact, I think I’m afraid of anything with wings. Even ladybugs! I have lived in Blythe, California for 37 years and never saw one until a month ago. Blythe is 99 miles north of the Mexico border along the Colorado River. Must be this giant moth found a new migration path. The one I saw hung around for a day and night. “Mine” was resting in a flowering Texas Sage bush until I passed by and then it flew around the corner of the house and rested above a window sheltered by the overhang of the roof. I had no interest in interfering with its destiny, but I did hope that it layed some eggs on that Texas Sage. I am so scared of these things!! I know they don’t bite scratch or any other harm, but I just am of scared of them! I have lived here in Cabo San Lucas, MX almost 3 years and I have never seen so many before. I moved here, from San Francisco Bay Area and want to move back!! Just kidding, I would just wish there were fewer of them! I was at the Goodwill shopping with a friend as we got in my truck to leave I saw what I thought was a bat ..then I could see it was a huge butterfly ..I hopped out of my truck to see it better it flew under my truck ..my friend never saw it .About an hour later I arrived home ..I heard flapping like a bird in the back seat…the witch moth had hitched a ride with me ! I gently picked it up to set it free…it flew over my roof into some trees …what an amazing sight! It was huge and a male I think ! I am in Southwest Oklahoma and have never seen anything like it! Exciting and wonderful! We have had a Black Witch moth perched outside on our patio wall for the past day here in Newport Beach. Wish I had seen it fly in! Quite an amazing creature! Glad we can provide safe harbor! I just saw one resting on my driveway here in north San Diego county this morning. It was a large male and of course I took pictures of it next to a Sharpie for scale and texted the pictures to my husband and kids. Just stunning. Off to buy a lotto ticket! Saw a black witch moth for the first time this evening August 8, 2016. At first I thought it was a bat, but followed it until it landed on a window sill and spread its wings. The black, brown, white design was absolutely stunning. The size of it was mind blowing as was the design. Location was in Blythe, California. One flew in to my bedroom last night and then to the hall where it spent the night. I opened the door this morning and it flew out. Live in Albuquerque. We are in Costa Rica, at the southern tip of the Nicoya Peninsula and have 2 Black Witch moths in the rafters of our porch. Hope it is good rather than bad luck. Hi Dianne from Ohio again . My husband informed me that there is no cacoon just the bat moth .they are amazing to look at, this is a first for me. I live in Ohio and a black witch moth just came out of its cacoon under a table on my front porch I have never seen anytihing like this in my life I was very freaked out at first but have been reading everyone’s comments and it must be what this is. It looks just like the pictures I have seen on line about this moth. What should I do if anything? I know the Black Witch is Migratory showing up in the Caribbean and in the Hawaiian Islands. I was wondering it’s cousin, another owlet moth called the White Witch ( Thysania agrippina ) Does it migrate outside of it’s normal range? I have lived on Montserrat, British West Indies and now live on Nevis. Being a Brit I find these moths totally fascinating and many have come into my home and sadly eventually expired. Nothing I do will ever persuade them to go back outside. Here they are called Money Moths and are considered lucky if they come into your home. As for the Death bit, well I will go with the local custom of believing them to be Money Moths although I am still waiting!” Maybe the next one in my bedroom will bring some for me! Lol. Thank you for this post, very helpful! My girlfriend and I spotted this very rare siting in our balcony just hanging there. We had no idea what it was and it HIGHLY resembled a bat at first. My girlfriend’s dog just died on Thursday and I can’t help but wonder if this was the dog’s spirit coming back to say goodbye? My gf and her dog were very close and she sadly had to part from the animal when she moved away to go to school in SD. We now both live in SD, and we are both in awe at this event! Just found a giant one hanging on my door knocker. It’s in a secluded hallway in Hollywood, CA, and I guess it won’t leave me until tonight. I’m in ill health and really don’t want this thing in my house! It’s easily 7 inches and does look like a bat. Never seen one in all my life living in CA. I bet it’s this hot, humid weather. My husband found one on the ground by the car (sadly lifeless) in Orange County, CA. (Tustin). Not sure why it died. I have never seen anything like this before and wonder if it was affected by the high temps here in CA. or if a cat or animal possibly got a hold of it? In any case, I would love to know why (or when) these moths are/have started to surface in CA. I have seen people on Facebook posting pictures of these moths and had never seen anything like this before. I’m in Mexico, and this male Black With Moth spent about 10 days in my room. I was going through a creative blank in my life, but all of a sudden, a whole story went through my head, thanks to this moth. I tried setting it free everyday, but it always came back in my room at night. Yesterday, I left him on a flower, and after trying to go back in my hand, I left it on the flower. There has been a storm during the day and he still hasn’t come back. Good night sweet prince. My son found a male Black Witch moth next to our front door (Anaheim, California) today, the wingspan just shy of 8 inches. At first I thought it was a bat! It stayed for several hours. When it finally decided to leave it flew like a bat… Could hear the wings flapping loudly! It was a beautiful, strange sight. I feel lucky ? Tonight, one flew into my window. This is the second one. The first time was in September 2014. I live in San Clemente, California. Drives my two huskys nuts trying to catch it. I’m trying to get it out of my house with no injury. It’s 8 inches. One of these just sailed onto my patio and is resting on the wall of my patio. Wings probably 5 inches tip to tip, so this is apparently a small one! Beautiful, and a nice Saturday morning treat here in Las Vegas. The picture I posted on Facebook is blowing up with everyone saying they have shown up around their homes recently here. Wonder if them showing up in numbers has anything to do with the hurricane off Baja Mexico? We had two of these on our front porch under an eave for the past four days, today there are six of them! Looks like 4 male/2 female. We live at 4500 ft. in Sedona AZ! We have mesquite trees and pines, they occasionally leave the porch for the trees. We bought lotto tcikets just in case. 🙂 My fiancees father passed away three weeks ago, he’s transformed we believed! Free from Parkinsons finally. Six of these huge moths is really something! That is a wondrous event and you should always remember it. Check my blogsite, http://www.thisismyorenda.com, in a few days for the details of my first encounter with a Black Witch. Truly a magic moment for me–and in many ways, an enlightening one. Found a tiger moth on the front screen door this morning. Thought it was stuck, I tried to blow it off, but it stayed still. My husband told me to leave it alone. Intrigued how it just stayed so still. Got great photos of one that flew into my garage. It was very startling in the darkness! San Diego by the way! Yes! Today around 2 p.m here in liberty station San Diego, one huge black moth which I thought was a bat as well was on the wall in my garage! I was so stunned but creeped out at the same time. I have never seen anything like this! Someone chased it out but it seemed to not want to leave. We didn’t want to hurt the beautiful creature. Now I feel bad that I didn’t let it stay a while. Looked like a butterfly when it flown to the ground. Wow it was august 2012 when the black witch moth flew on my head in my kitchen in San Diego. I had not heard of them being here before. I ticket to the patio because it was breathing hard which I believe was actually my father transformed as he was having a heart attack in Oregon. I came back in and realized I should take a picture and immediately came back out but it had disappeared almost like it was just a mirage. I’m in Bankers Hill in San Diego & came home last night to find one above my neighbor’s door. Scared me so bad! I hate bugs, moths, etc. I can’t imagine if this flew on my head. I’d probably have a heart attack. I wish I didn’t have this phobia because there are millions of different species in the world & I’d like to be able to hold them or not freak out. But flapping wings scare me! The one hanging here does not have spots. It looks solid black. But after reading all these myths I’m going to go get a lottery ticket! Also, my dad died in 2013. When he died, a huge flying insect landed in my car while driving. I freaked out. But then people told me it was my dad saying bye. I didn’t believe them, but I think now I’ll look at this Mothra as my dad visiting. Maybe it’ll lessen the fear factor. Unless it flaps it’s wings & comes into my apt. Then it’s screaming time! Found a large male (7″ wingspan) on the outside wall next to my office door in Sierra Vista, Arizona yesterday (15 September 2014). He is still there today. Guessing he is sitting out the heavy rains we will be receiving over the next couple of days before he resumes his journeys. I was walking in the parking lot going to church and just looked down and saw this huge grayish blackish moth . I first thought it was a baby bat. What could this mean, I just recently started going back to church. I’m sitting here in my living room in Scottsdale, AZ, looking at one resting near the ceiling of my back balcony. My cat spotted it first, and when I looked to see what she was gazing at, I first thought it was a bat. It’s huge — the wingspan is easily 7 inches. Maybe I should buy some lottery tickets when I go out this evening? Do it ! Let us know if you win. I have, one what should I do with it? Leave it be to do its thing. Ha ha. Good luck to you, Erika. Let us know if you win–do we get a commission? I have been blessed with many encounters with this moth, here in hawaii we believe it is a loved one come to visit, or say goodbye, one came on my moms birthday, she passed away 20 years before, and I found it passed away after photographing it where i work,( nursing home) I mounted it and gave to my father, he loves it. I have extensive photos of them, And find them most beautiful, I have a female in my chicken house right now, she loves hawaiian honey in water, and has been in my house for over 2 weeks now. I feel blessed when I encounter these special creatures, And have had so many encounters I have lost track. Aloha from Hawaii. They are all good. Yesterday saw one in my sun pourch. Thought it was a bird. Waving hands trying to herd it towards the door. It went out then came back. Waved hands again and it left. Got on computer and looked up moths of Texas and there it was. First sighting for me. Huge! Mine returned again! He was resting on the recliner i ait on. Saw him last week…my leg started hurting really bad to where i can’t walk…then got a call this morning from dr that i have a pinched nerve in my hip. Could the double sighting be a warning? proved true to me…coming in to money as well as death of a loved one. There has been one resting on my screen door all day. I had to visit quite a few websites to make the ID. I live outside of Nazareth, PA, so this is a rare moth for us to see. The really odd thing is that my son is coming home from Texas next week and he lived in Mexico for a short time. I would like to send a picture of the moth. I believe we have one on our back porch right now. It hasn’t moved in several hours. It is on the beam across the back porch. Came home this morning from work and noticed that we have another male roosting above our front door. We’ve had them in our house too. Im in Lubbock and have only seen these in the fall. I feel blessed to have one on the July 19th. 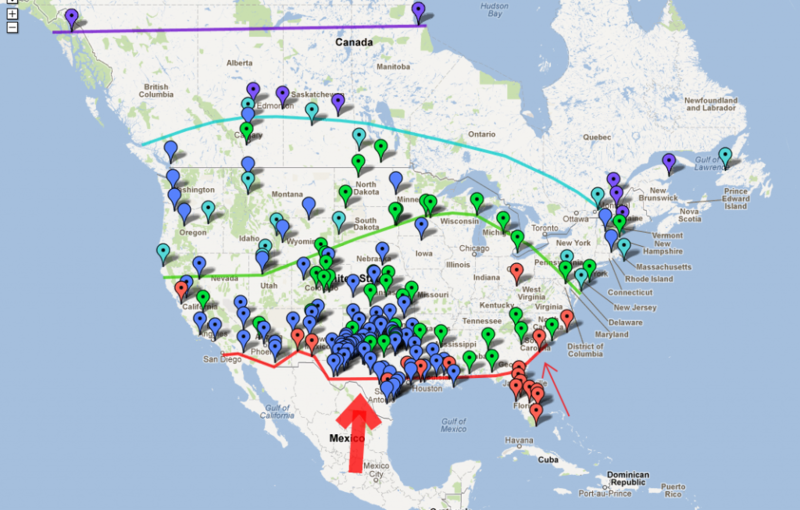 We are northerners who have been living in south Texas fir 2 1/2 years…. And we’re convinced there was a bat flying around in our house! Turns out, it was just this moth! We have big mesquite trees in our back yard… Makes sense…… And I’m so glad it wasn’t a bat! 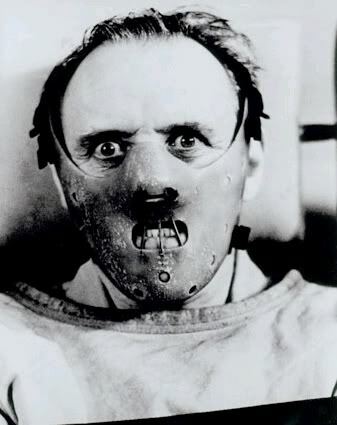 Actually Hannibal Lector didn’t insert Moths in the throats of his victims, Hannibal ate his victims. Buffalo Bill was the one who inserted Moths in the throats of his victims. We have one perched on our pool deck and it’s about 7″ we weren’t sure what it was but it’s a very interesting creature. I found your site during a Google search for a large moth my husband found in the doorway to his work this morning. Turns out it was a Black Witch Moth. Thank you for this informative page! Glad it was helpful for you, Rachel. in my kitchen of my condo in San Diego, I had been stressed out and not sleeping because my father was suddenly in ICU, on life support and I could not sleep at all. I was the one responsible for him and the nurses were talking to me late into the night. vanished. Later that morning I found my dad had a massive heart attack that night. I firmly believe he was visiting me to let me know he had transitioned and was at peace. I never saw one since that time, and feel this was a magical experience. It has helped me to deal with his death. I can totally understand how you felt/feel. Although it normally applies to the relieving of emotional tensions through a reaction to art, I think the term catharsis applies here….nature is art to me anyway. Best wishes to you. I just came across a Black Witch moth at work in Lake Arrowhead California a week ago, and just like one of your readers noticed that it was dying and brought it home. I put my hand to it, and it crawled on without hesitation. I shared it with my best friend and ex-wife (the same person) As we talked about my experience with him, it was a male, it passed away on the table of our deck in the back yard. When I first saw him I felt an overwhelming flood of emotions, and could not figure out why, until I realized that It felt like I was seeing God. I cried uncontrollably, off and on for hours. I know that it is a sign of death and/or money, but none of that was the case for me. I felt blessed as well. In looking back it could have signaled the end of my marriage, but the beginning of a new relationship with my ex. I still have him in a shadow box in the dinning room. A pivotal interaction that I will never forget. They roost at my house at least twice a year. I have a picture of one that was close to 9″ long. They are stunning! I agree! Biggest moth in North America, ubiquitous in Texas this time of year. I thought the Cecropia silk moth held the title of largest moth in North America. Now I’m confused. North America’s largest, native moth known as the Cercopia Moth, which is a member of the Giant Silk Moth family. Moth groups include micro moths, leaf miners, clothes moths, plume moths, ermine moths, burnets, geometrids, silk moths, sphinx moths, tiger moths, wasp moths, noctuids, underwings and many others. Maybe the black witch is the largest Noctuid moth and the Cecropia is the largest moth overall. Don’t know for sure. Experts, please clarify. There’s also the possibility that it could have been the related White Witch from Mexico, which reaches at least 11″ and would be a first for North America. Did it look paler than the usual Black Witch? Send me the picture if you have it! I came across a Black Witch moth a few years ago flapping at the edge of the road (Blanco/Lockhill Selma). The moth was no longer able to fly (old age? wounded in some way?) but I carried it gently home and sat outside with it perched on my hand for a long, long while. An exquisitely beautiful being with a rare presence. I really felt blessed. I think they are beautiful. Turn the pic of the moth above upside down and it looks like a fat toad! !